After spending the last couple of years consulting around the SaaS and Web 2.0 worlds, I’ve decided to take the startup plunge again and settle down in the clouds. 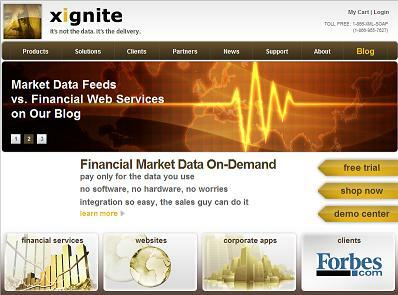 I recently joined Xignite, a cutting edge on-demand cloud services and mashup platform provider that helps companies incorporate accurate, current financial information directly into websites and applications via Web services, i.e., no integration programming required! The company is off-the-charts on the SaaS Success Top Ten Dos and Don’ts as evidenced by everything from the potential market (market data is a multi-billion dollar industry already…based on really old legacy stuff) to the e-commerce Web site to mass customization via the Splice on-demand mashup platform. Plus, the team is great from the sales reps to the board and the culture is pure software-as-a-service. We have an Xignite company blog at xignite.web-services-blog.com, so my loyal readers can rest assured that opinions expressed here at Chaotic Flow will remain as objective as ever, but they may start taking a bit of a bent toward the emergence of cloud services…which differ from application-oriented SaaS in some distinct ways that directly impact the economic and business model dynamics–not the least of which is that they are used by computers instead of human beings. However, the primary value proposition at Xignite remains classic SaaS vs. Software, or in financial services industry-speak financial web services vs. market data feeds. The Cloud is proving it’s power for cloud testing every day.